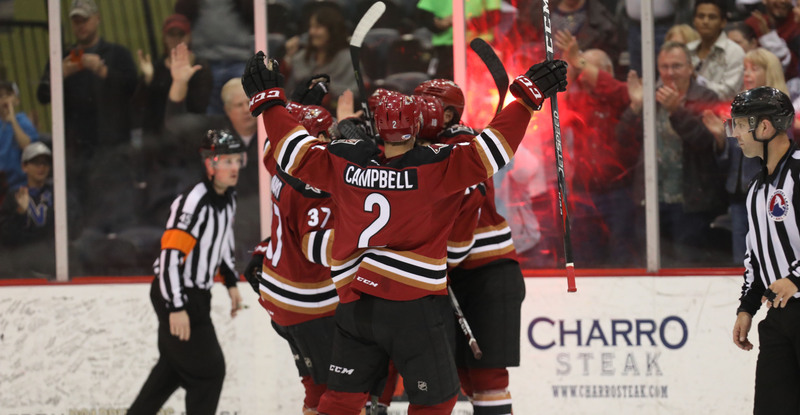 The Roadrunners secured home-ice for the first round of the Calder Cup playoffs with Friday night’s 3-0 win over the defending champion Grand Rapids Griffins at Tucson Arena. Adin Hill pitched his fourth shutout of the season, turning away all 26 shots he faced in earning his 17th win of the campaign. For the team as a whole, it’s the fifth time they’ve blanked an opponent this year. The first goal of the evening wasn’t registered until just past the midway point of the game, when Lawson Crouse buried his 11th of the season with 9:42 left to play in the second period to give the Roadrunners a 1-0 lead. Crouse, who beat Tom McCollum with a move to the backhand after splitting two Grand Rapids defensemen, extended his point streak to four games, tying his season-high mark. 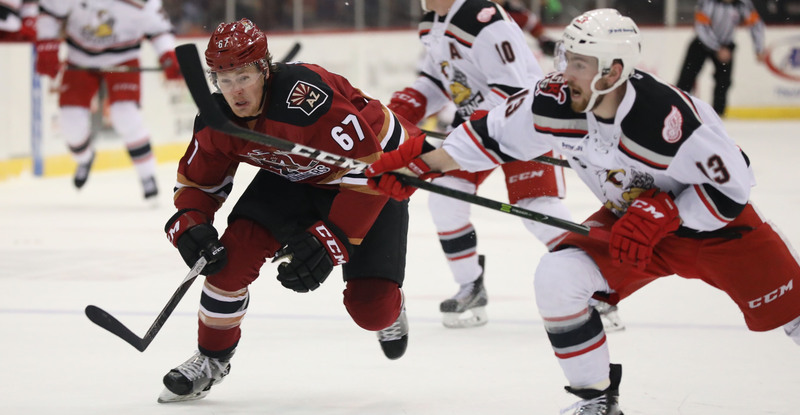 Just over five minutes into the third, Ryan MacInnis padded the Roadrunners' lead when his wrist shot from the right circle found its way through McCollum’s right armpit, putting Tucson up by a 2-0 count. MacInnis’ goal, his sixth of the season, extended his point streak to four games. With just over nine minutes to play in the third, Hill made what is arguably the save of the season when he denied Zach Nastasiuk’s back-door bid, diving across the crease to stop the puck with the paddle of his stick. Tye McGinn added an empty-net tally with 50 seconds remaining to give the Roadrunners a 3-0 lead. The Roadrunners’ magic number to clinch the Pacific Division now stands at 4. The teams will reconvene for a rematch on Saturday night at Tucson Arena, where the puck is scheduled to drop just after 7:05 PM.